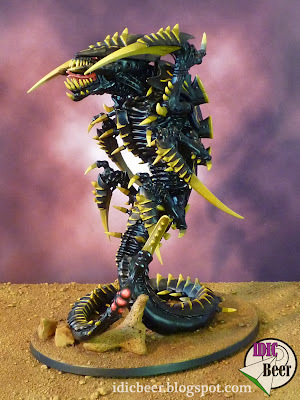 IDICBeer 40k: How will 6th Edition effect my Tyranids? 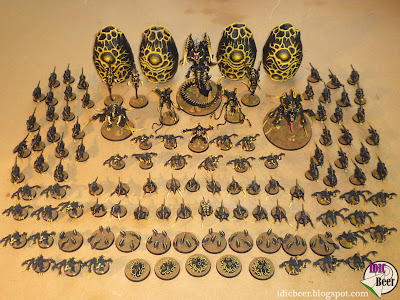 How will 6th Edition effect my Tyranids? I had a lot of fun with my Nids when their new Codex hit in 5th Edition, no need to go on about all the negatives it got as a 'competitive' Codex. Personally, I found the book great fun, with some funky units to choose from. I don't think I have had one game with the bugs where I haven't enjoyed myself, unlike some of my other armies! Getting your bugs killed is actually quite rewarding, as long as you have the mind set for it, and a plan to go with it of course. I think out of all my armies though, Tyranids are going to need the biggest changes to my lists. Most of my list concepts and ideas are just not going to work anymore, due to the rule changes. No assault from the reserve or the flank! No reserving everything and then there is Overwatch! Most of these things can be overcome, but it is unlikely that I will be able to throw any of my previous lists down on the table with any success. So where to start with a new list? Well, for me and for most of you probably, Nids are all about lots and lots of bugs swarming towards you. In the past, this hasn't generally been the case for Nids, but I am starting to think that things are going to change now. The new Fearless rule for when you are in Synapse range is the single most best rule that Nids now have, no fearless wounds from losing an assault is going to have a huge impact on our army and how it works. I still think there is room for some of the other bigger bugs of course, as you always need a good mix of things, but I seriously think that lots of big groups of Hormagaunts and Termagants as Troops choices in Synapse range, are going to be a force to be reckoned with and a good place to start our army builds. Twenty plus Gants in the assault will hold up a group of Marines for a good few turns, with plenty more Gants spare to back them up. As for Genstealers, the Genestealer shock is now on themselves as they can no longer assault from the flank. Most people have written them off it seems, but I'm not going to stick them at the bottom of my case just yet. Small groups infiltrating could be a nice distraction and there is also the Broodlord and his Psychic Power abilities to take into consideration. Worse case scenario, they will just have to morph into Ymgarl Stealers. Most of the bigger bugs on offer will be very similar to what they were before with the exception of the Winged stuff, I'm very happy to see the Winged Hive Tyrant get a buff, as I have been wanting to paint mine up for ages. I've had my Tyrant a very long time and I originally modelled it up with dual Talons. I think I will magnetise its arms before I paint it to give me some gun options. I am also very pleased to see Ravener get a bit better with the new Beast rules, ok they still suffer from instant death when hit by strength eight missiles or better, but they are definitely better than they were before. Overall, I am now actually really looking forward to developing my army for 6th. I say now, because it's fair to say that I was a bit disappointed with how 6th had treated Nids at first. In reality though, I think 6th has just made the army more realistic. Tyranids will have to be played like I have always wanted to play them, as many bugs as possible with a few big ones thrown in for good measure. Oh lets face it....just like Starship Troopers! I've been loving my Nids so far this Ed. As you said, Gant hordes can easily hold up enemy squads for a turn or two (I had a Gant brood hold up a Paladin squad for an entire game - it was beautiful!). Tervigons actually have a purpose now; they are even better psychic buffers with 3 Biomancy powers and I am now running all my Tervs with Crushing Claws and they are annihilating enemy mech with their Crush attacks. FMCs are fun right now, but as soon as Skyfire starts to proliferate I don't think I'll be running them; grounding tests are just mean! To compensate for our lack of Skyfire I have been fielding LOTS of T/L Devs and it has been working ok against small numbers of flyers. I can live without my Genestealers Infiltrating and Hormagaunts are almost a third of the price, so I see those getting used much more in future.